OVERVIEW • FileViewer USB is a file viewing, storage, transfer, printing, and email application for the iPhone. 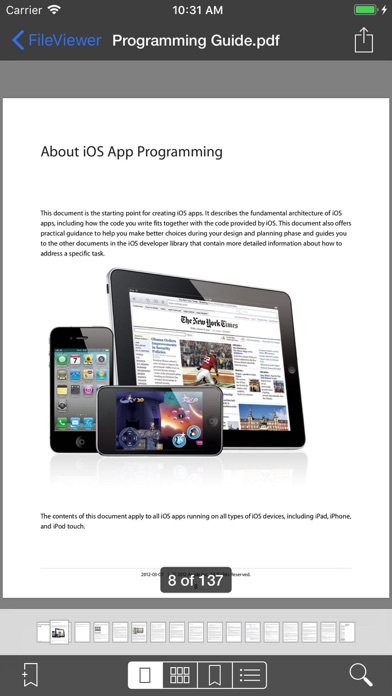 It includes one of the best PDF viewers for the iPhone and can also view many other file types. 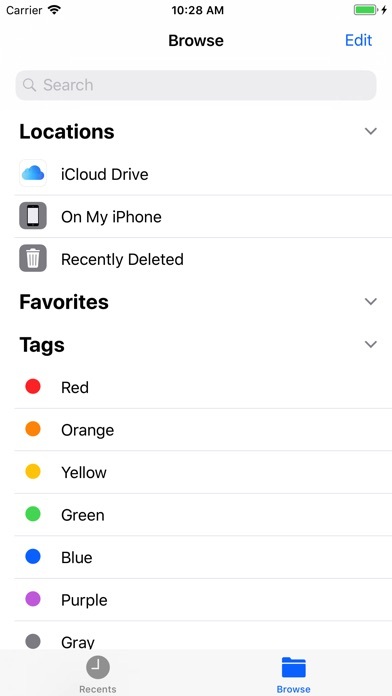 Files are transferred between iOS device and computer via iTunes, using a Wi-Fi or USB connection, or via Airdrop. FILE VIEWING • Supported file types for direct viewing or listening include portable document format (.pdf), Microsoft Word (.doc & .docx), rich text format (.rtf), plain text files (.txt), Microsoft Excel (.xls & .xlsx), Microsoft PowerPoint (.ppt & .pptx), iWork files (.pages, .key, & .numbers), HTML documents (.html & .htm), web archives (.webarchive), image files (.jpg, .jpeg, .jp2, single & multipage .tif/.tiff, .gif, .bmp, & .png), audio files (.m4a - Apple Lossless & AAC formats, .mp3, .wav, and .aif), video files (.mp4, .m4v, .mov, and .3gp), and other file types (.h, .m, .c, .java, .js, .csv, & .log). • PDF reader is fast, handles large pdf files, and opens password-protected pdfs. 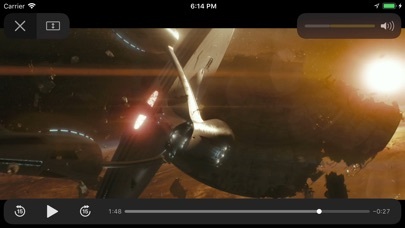 A thumbnail scroll bar feature facilitates viewing of long documents. Pages can be bookmarked. Other features include search, markup functionality, and table of contents view. 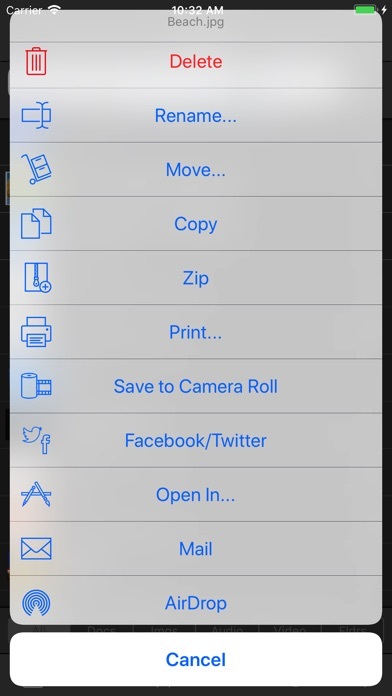 • Photos from the Photos app on the iPhone can be transferred to and viewed in FileViewer. • Images can be copied from this app to the device's camera roll. Images in a given folder can be viewed as a slide show. • Landscape mode as well as zooming and panning is supported for viewing documents and images. FILE & FOLDER MANAGEMENT • Folders can be created to organize files. • Files and folders can be deleted and renamed as well as moved or copied from one folder to another. • Multiple files can be deleted or moved to a different folder at the same time. 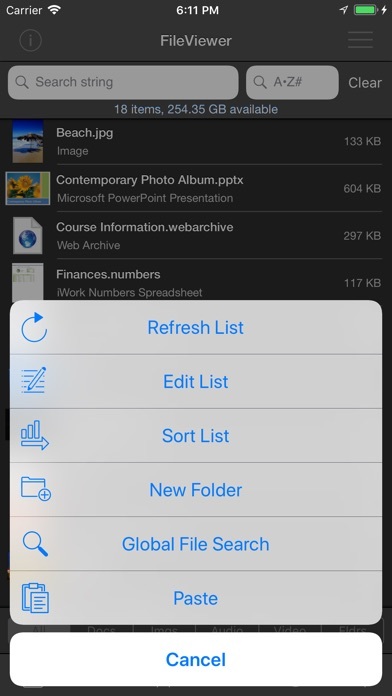 • FileViewer files can be opened in other apps on the iPhone. • File and folder lists can be filtered by file type, folders, search phrase, and first letter of name. • Files and folders can be sorted by date, size, and modification date (ascending & descending). • Global file search. • Zip archives can be transferred to and unzipped in FileViewer, providing easy one-step transfer of groups of files and/or folders. Zip archives can be created from files and folders stored in FileViewer USB. • Capability to save many document types as a PDF. 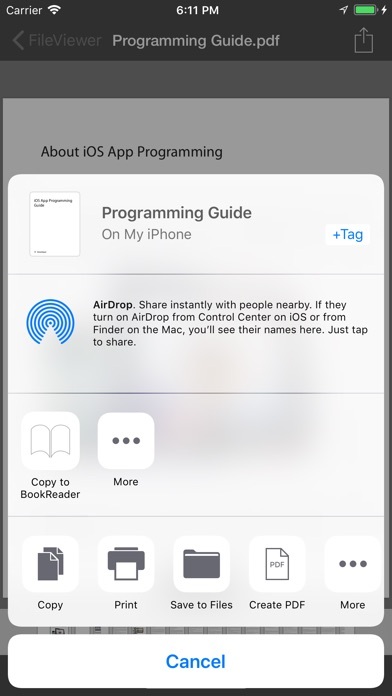 AIRDROP • With AirDrop, users can share files directly between supported iOS devices, as well as between an iOS device and computer. SOCIAL MEDIA • Post images and web pages to Facebook and Twitter. EMAIL • Files ≤ 20 MB can be emailed as an attachment. • Email attachments can be transferred from the Mail app to FileViewer USB. PRINTING • Documents and images can be printed to AirPrint/ePrint compatible printers. CLOUD STORAGE • Connectivity to iCloud Drive, Box, Dropbox, Google Drive, and Microsoft OneDrive. AIRPLAY & DISPLAYING FILES ON AN EXTERNAL DISPLAY • Using AirPlay, you can wirelessly stream iPhone screen output, via an Apple TV, to an HDTV. • Audio can be wirelessly streamed using AirPlay, via an Apple TV, to an audio system. REQUIREMENTS • iOS 12 (or higher). 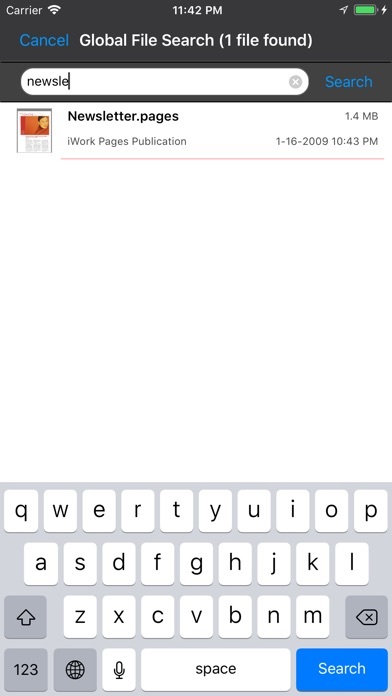 • File transfer via iTunes requires a Wi-Fi or USB connection between your iOS device and computer. SECURITY • Use your fingerprint (Face ID on iPhone X/XS Max/XR) or a password to protect access to FileViewer USB. • Individual files are protected using iOS data protection. HELP • Help is built into and available from within the FileViewer USB application. This app saved me in a pinch. Also, very helpful for keeping secure documents on your phone. Update for iOS 7 only. Very flexible, easy to use app to organize many common file types. So glad I found it! This is perfect for file management between the phone/iPad and computer... Well-done and easy to use. Thanks for a great app! The only file management program I have used on my iPhone. Works great!